Triumphus Cupidinis. In-houdende veel schoon stichtighe, en[de] seer vermaeckelijcke liedekens, en[de] andere ghedichten, verciert met veel loffelijcke sententien, als oock sommighe epitalamien, bruyloft-liedekens en andere poëmata. -Ecomium matrimonii. 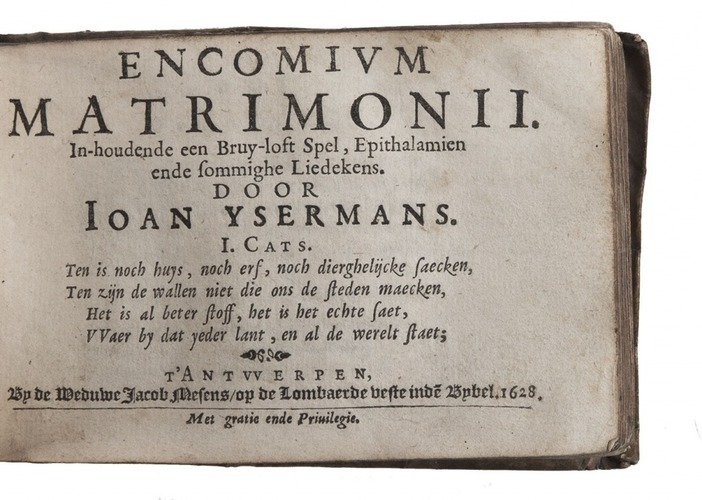 In-houdende een bruy-loft spel, epithalamien ende sommighe liedekens. -Nederlantsche poëmata. In-houdende sommighe sonetten, liedekens, graf-dichten ende andere. Antwerp, widow of Jacob Mesens, 1628. 3 parts in 1 volume. Small oblong 8vo (8.5 x 12.5). With richly engraved allegorical frontispiece by Anthoni Spirincx and many songs accompanied by music scores. 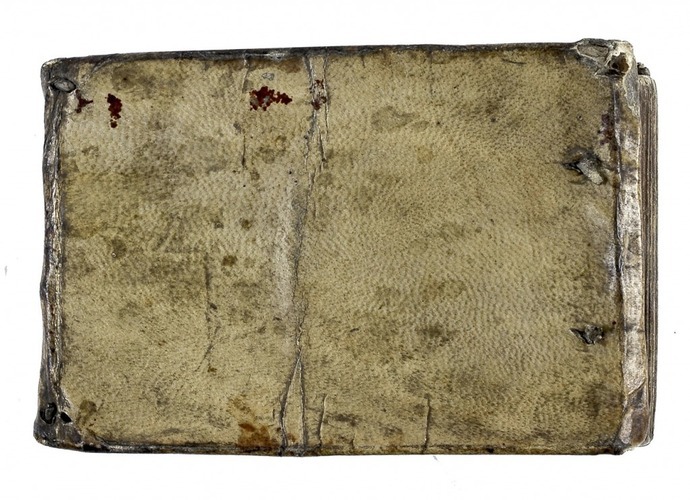 Contemporary sheepskin parchment. 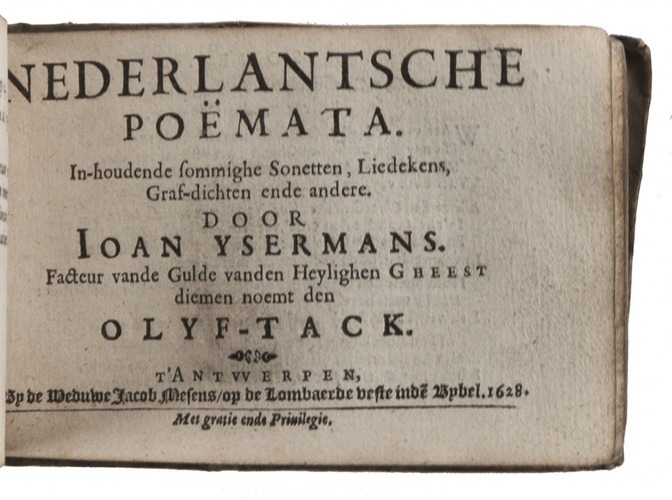 Rare first and only edition of a collection of Dutch songs and poems by the playwright Joan Ysermans, member of the Antwerp chamber of rhetoric "De Olijftak". The work is divided in three parts and contains many songs from the unpublished plays of the author, with light-hearted love songs in the first and second parts and more serious poems in in third. 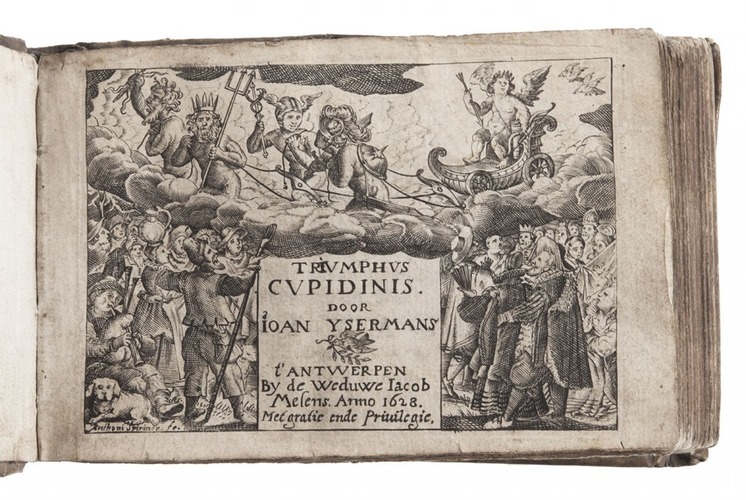 In 1633 appeared, as an explicit reaction against the secular character of Yserman's work, the anonymous Triumphus Jesu, containing devotional songs and poems. With old ownerships inscription of A.C.I. van Landeghem on title-page, some thumbing throughout. Binding and flyleaves soiled. Good copy. Goovaerts, Typ. Mus. 589 ("excessivement rare"); Scheurleer, Liedboeken, p. 153; STCV (3 copies, incl. 2 incomplete); WordCat (7 copies).